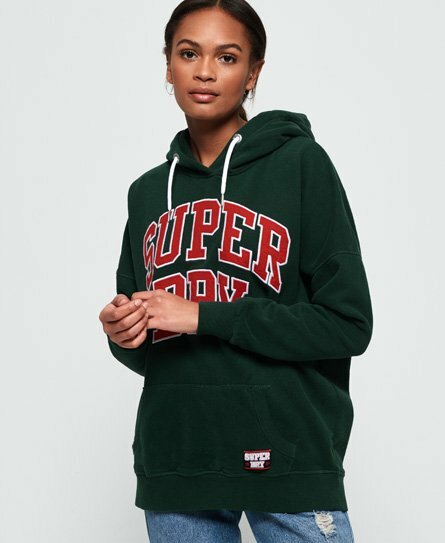 Superdry women’s Blair boyfriend hoodie. Cosy up this season wearing the Blair boyfriend hoodie, with a brushed cotton inner lining and ribbed cuffs and hem, you’ll not want to take this one off. It features a draw cord hood, an applique Superdry logo across the chest and a handy large pocket. For the finishing touch, this hoodie has been completed with a Superdry patch on the pocket. Channel the athleisure trend this season by pairing this with your favourite joggers and trainers. Or for a more everyday look, this hoodie pairs well with jeans.